Chai-spiced chocolate tart, chocolate tips AND a giveaway! It’s GBBO finals day so I’m sharing a gorgeous, shiny new recipe with you all! I’ve partnered with Lindt Excellence to whip up some indulgent chocolate bakes using their delicious bars. This tart showcases chocolate at it’s finest and is super intense in flavour. The chai spices add a lovely warmth to the filling that makes you want to snuggle into autumn by a fireside with a generous portion. Tip 1: Always choose premium. Baking with good-quality chocolate is paramount to creating good quality bakes, especially in a tart like this one where chocolate is the star. 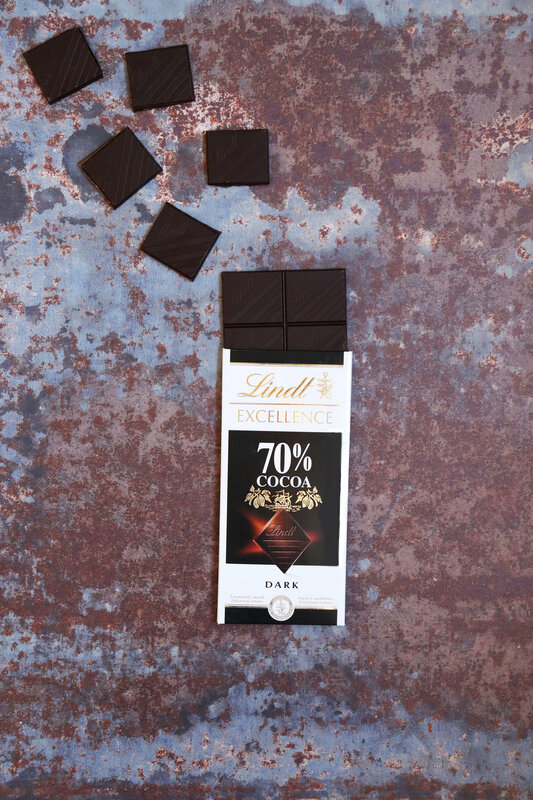 Lindt Excellence bars range from 70% cocoa solids to 99% cocoa solids, all which have their place in the baking world. As standard, I usually bake with 70-80% chocolate as I particularly like the balance of bitterness and richness, but the high percentages can be lovely in homemade truffles and in small amounts. Tip 2: Heat with caution! Chocolate is very sensitive to heat and burns easily. A good thing to remember is that a chocolate bar will melt in your pocket, so never needs excessive heat. Always heat indirectly over a very low heat. A metal bowl helps you control the heat best as it is a great conductor. Tip 3: Add salt! Sea salt and chocolate might sound like a strange combination, but salt helps to bring out the different flavour profiles in the chocolate and compliments it really well. Try it next time you’re baking with chocolate - you might be pleasantly surprised! 1. Place the flour, cocoa powder and icing sugar into a large bowl and mix all the ingredients together until they are well combined. Add the butter into the bowl and rub the cubes into the flour until you get a mixture that looks like fine breadcrumbs. 2. Add the egg yolk and 1 tablespoon of cold water and stir into the flour with a round ended knife. The mixture will start to clump together after you have mixed for a minute or so, but there will still be some flouring patches in the bowl. Turn the contents of the bowl onto a large piece of clingfilm and knead briefly until all the pastry has come together into a ball. Wrap in clingfilm and place in the fridge for 30 minutes. 3. Roll the pastry out into a large circle a few centimetres larger than the tin – I like to do this between two pieces of clingfilm. Turn the pastry into the prepared tin, gently pressing the pastry right into the corners. If there are any obvious holes, patch them up with little pieces of leftover pastry. 4. Pierce the pastry bottom with a fork, and then line the inside of the pastry with baking parchment and baking beans. You could use rice or lentils, anything that will hold the paper down will work. Blind bake the pastry case for 10 minutes, and then remove the paper and beans and bake for a further 10 minutes, or until the pastry is crisp. Leave to cool completely before filling. 5. Stir together the cream, honey and spices in a small saucepan and heat gently until beginning to steam. Don’t let the cream boil. Finely chop the chocolate and place it into a large bowl. Remove the cardamom pods, then pour the hot cream mixture over the chocolate. Whisk until the chocolate is completely melted, then pour the ganache into the tart case. 6. Allow the tart to set for at least 2 hours at room temperature before slicing and serving. Head over to my Instagram page to find out how you can get your hands on an incredible Lindt Chocolate hamper!